1 A None No Power Seat 1 A is a standard Economy Class seat that JetBlue designates as an "Even More Space" seat. This seat offers an extra 4 inches of legroom compared to Core seats. However the proximity of the bulkhead for this row of "Even More Space" seats restricts the legroom. There is an additional fee to book this seat. The tray table is in the armrests, making the armrests immovable and slightly reducing seat width. Passengers must place personal items in the overhead bin during take off and landing. 1 B None No Power Seat 1 B is a standard Economy Class seat that JetBlue designates as an "Even More Space" seat. This seat offers an extra 4 inches of legroom compared to Core seats. However the proximity of the bulkhead for this row of "Even More Space" seats restricts the legroom. There is an additional fee to book this seat. The tray table is in the armrests, making the armrests immovable and slightly reducing seat width. Passengers must place personal items in the overhead bin during take off and landing. 1 C None No Power Seat 1 C is a standard Economy Class seat that JetBlue designates as an "Even More Space" seat. This seat offers an extra 4 inches of legroom compared to Core seats. However the proximity of the bulkhead for this row of "Even More Space" seats restricts the legroom. There is an additional fee to book this seat. The tray table is in the armrests, making the armrests immovable and slightly reducing seat width. Passengers must place personal items in the overhead bin during take off and landing. 1 D None No Power Seat 1 D is a standard Economy Class seat that JetBlue designates as an "Even More Space" seat. This seat offers an extra 4 inches of legroom compared to Core seats. However the proximity of the bulkhead for this row of "Even More Space" seats restricts the legroom. There is an additional fee to book this seat. The tray table is in the armrests, making the armrests immovable and slightly reducing seat width. Passengers must place personal items in the overhead bin during take off and landing. 1 E None No Power Seat 1 E is a standard Economy Class seat that JetBlue designates as an "Even More Space" seat. This seat offers an extra 4 inches of legroom compared to Core seats. However the proximity of the bulkhead for this row of "Even More Space" seats restricts the legroom. There is an additional fee to book this seat. The tray table is in the armrests, making the armrests immovable and slightly reducing seat width. Passengers must place personal items in the overhead bin during take off and landing. 1 F None No Power Seat 1 F is a standard Economy Class seat that JetBlue designates as an "Even More Space" seat. This seat offers an extra 4 inches of legroom compared to Core seats. However the proximity of the bulkhead for this row of "Even More Space" seats restricts the legroom. There is an additional fee to book this seat. The tray table is in the armrests, making the armrests immovable and slightly reducing seat width. Passengers must place personal items in the overhead bin during take off and landing. 10 A None No Power Seat 10 A is a standard Economy Class seat that JetBlue designates as an "Even More Space" seat. This seat offers an extra 5 inches of inches of legroom compared to Core seats. While these seats have extra legroom due to the Exit Row, they have limited or no recline. 10 B None No Power Seat 10 B is a standard Economy Class seat that JetBlue designates as an "Even More Space" seat. This seat offers an extra 5 inches of inches of legroom compared to Core seats. While these seats have extra legroom due to the Exit Row, they have limited or no recline. 10 C None No Power Seat 10 C is a standard Economy Class seat that JetBlue designates as an "Even More Space" seat. This seat offers an extra 5 inches of inches of legroom compared to Core seats. While these seats have extra legroom due to the Exit Row, they have limited or no recline. 10 D None No Power Seat 10 D is a standard Economy Class seat that JetBlue designates as an "Even More Space" seat. This seat offers an extra 5 inches of inches of legroom compared to Core seats. While these seats have extra legroom due to the Exit Row, they have limited or no recline. 10 E None No Power Seat 10 E is a standard Economy Class seat that JetBlue designates as an "Even More Space" seat. This seat offers an extra 5 inches of inches of legroom compared to Core seats. While these seats have extra legroom due to the Exit Row, they have limited or no recline. 10 F None No Power Seat 10 F is a standard Economy Class seat that JetBlue designates as an "Even More Space" seat. This seat offers an extra 5 inches of inches of legroom compared to Core seats. While these seats have extra legroom due to the Exit Row, they have limited or no recline. 11 A None No Power Seat 11 A is a standard Economy Class seat that JetBlue designates as an "Even More Space" seat. This seat offers an extra 5 inches of inches of legroom compared to Core seats. This seat is missing the armrest which may be uncomfortable. 11 B None No Power Seat 11 B is a standard Economy Class seat that JetBlue designates as an "Even More Space" seat. This seat offers an extra 5 inches of inches of legroom compared to Core seats. 11 C None No Power Seat 11 C is a standard Economy Class seat that JetBlue designates as an "Even More Space" seat. This seat offers an extra 5 inches of inches of legroom compared to Core seats. 11 D None No Power Seat 11 D is a standard Economy Class seat that JetBlue designates as an "Even More Space" seat. This seat offers an extra 5 inches of inches of legroom compared to Core seats. 11 E None No Power Seat 11 E is a standard Economy Class seat that JetBlue designates as an "Even More Space" seat. This seat offers an extra 5 inches of inches of legroom compared to Core seats. 11 F None No Power Seat 11 F is a standard Economy Class seat that JetBlue designates as an "Even More Space" seat. This seat offers an extra 5 inches of inches of legroom compared to Core seats. This seat is missing the armrest which may be uncomfortable. 12 A None No Power Seat 12 A is an Economy Class seat that has a misaligned window. 12 F None No Power Seat 12 F is an Economy Class seat that has a misaligned window. 13 A None No Power Seat 13 A is an Economy Class seat that has a misaligned window. 13 F None No Power Seat 13 F is an Economy Class seat that has a misaligned window. 18 A None No Power Seat 18 A is an Economy Class seat that has a misaligned window. 18 F None No Power Seat 18 F is an Economy Class seat that has a misaligned window. 2 A None No Power Seat 2 A is a standard "Even More Space Seat" which offers an extra 4 inches of legroom compared to Core seats. 2 B None No Power Seat 2 B is a standard "Even More Space Seat" which offers an extra 4 inches of legroom compared to Core seats. 2 C None No Power Seat 2 C is a standard "Even More Space Seat" which offers an extra 4 inches of legroom compared to Core seats. 2 D None No Power Seat 2 D is a standard "Even More Space Seat" which offers an extra 4 inches of legroom compared to Core seats. 2 E None No Power Seat 2 E is a standard "Even More Space Seat" which offers an extra 4 inches of legroom compared to Core seats. 2 F None No Power Seat 2 F is a standard "Even More Space Seat" which offers an extra 4 inches of legroom compared to Core seats. 24 A None No Power Seat 24 A is a standard Economy Class seat. There may be limited storage space in the overhead bin since this is usually used for food supply storage for the galley in the back of the plane. 24 B None No Power Seat 24 B is a standard Economy Class seat. There may be limited storage space in the overhead bin since this is usually used for food supply storage for the galley in the back of the plane. 24 C None No Power Seat 24 C is a standard Economy Class seat, however, the proximity to the lavatories may be bothersome. There may be limited storage space in the overhead bin since this is usually used for food supply storage for the galley in the back of the plane. Passengers flying in this seat may be disturbed periodically from working crew members going in and out of the overhead bin for food supply. 24 D None No Power Seat 24 D is a standard Economy Class seat, however, the proximity to the lavatories may be bothersome. There may be limited storage space in the overhead bin since this is usually used for food supply storage for the galley in the back of the plane. Passengers flying in this seat may be disturbed periodically from working crew members going in and out of the overhead bin for food supply. 24 E None No Power Seat 24 E is a standard Economy Class seat. There may be limited storage space in the overhead bin since this is usually used for food supply storage for the galley in the back of the plane. 24 F None No Power Seat 24 F is a standard Economy Class seat. There may be limited storage space in the overhead bin since this is usually used for food supply storage for the galley in the back of the plane. 25 A None No Power Seat 25 A is a standard Economy Class seat located in the last row of the plane. The proximity to the lavatories may be bothersome. There may be limited storage space in the overhead bin since this is usually used for food supply storage for the galley in the back of the plane. Passengers flying in this seat may be disturbed periodically from working crew members going in and out of the overhead bin for food supply. 25 B None No Power Seat 25 B is a standard Economy Class seat located in the last row of the plane. The proximity to the lavatories may be bothersome. There may be limited storage space in the overhead bin since this is usually used for food supply storage for the galley in the back of the plane. Passengers flying in this seat may be disturbed periodically from working crew members going in and out of the overhead bin for food supply. 25 C None No Power Seat 25 C is a standard Economy Class seat located in the last row of the plane. The proximity to the lavatories may be bothersome. There may be limited storage space in the overhead bin since this is usually used for food supply storage for the galley in the back of the plane. Passengers flying in this seat may be disturbed periodically from working crew members going in and out of the overhead bin for food supply. 25 D None No Power Seat 25 D is a standard Economy Class seat located in the last row of the plane. The proximity to the lavatories may be bothersome. There may be limited storage space in the overhead bin since this is usually used for food supply storage for the galley in the back of the plane. Passengers flying in this seat may be disturbed periodically from working crew members going in and out of the overhead bin for food supply. 25 E None No Power Seat 25 E is a standard Economy Class seat located in the last row of the plane. The proximity to the lavatories may be bothersome. There may be limited storage space in the overhead bin since this is usually used for food supply storage for the galley in the back of the plane. Passengers flying in this seat may be disturbed periodically from working crew members going in and out of the overhead bin for food supply. 25 F None No Power Seat 25 F is a standard Economy Class seat located in the last row of the plane. The proximity to the lavatories may be bothersome. There may be limited storage space in the overhead bin since this is usually used for food supply storage for the galley in the back of the plane. Passengers flying in this seat may be disturbed periodically from working crew members going in and out of the overhead bin for food supply. 3 A None No Power Seat 3 A is a standard "Even More Space Seat" which offers an extra 4 inches of legroom compared to Core seats. 3 B None No Power Seat 3 B is a standard "Even More Space Seat" which offers an extra 4 inches of legroom compared to Core seats. 3 C None No Power Seat 3 C is a standard "Even More Space Seat" which offers an extra 4 inches of legroom compared to Core seats. 3 D None No Power Seat 3 D is a standard "Even More Space Seat" which offers an extra 4 inches of legroom compared to Core seats. 3 E None No Power Seat 3 E is a standard "Even More Space Seat" which offers an extra 4 inches of legroom compared to Core seats. 3 F None No Power Seat 3 F is a standard "Even More Space Seat" which offers an extra 4 inches of legroom compared to Core seats. 4 A None No Power Seat 4 A is a standard "Even More Space Seat" which offers an extra 4 inches of legroom compared to Core seats. 4 B None No Power Seat 4 B is a standard "Even More Space Seat" which offers an extra 4 inches of legroom compared to Core seats. 4 C None No Power Seat 4 C is a standard "Even More Space Seat" which offers an extra 4 inches of legroom compared to Core seats. 4 D None No Power Seat 4 D is a standard "Even More Space Seat" which offers an extra 4 inches of legroom compared to Core seats. 4 E None No Power Seat 4 E is a standard "Even More Space Seat" which offers an extra 4 inches of legroom compared to Core seats. 4 F None No Power Seat 4 F is a standard "Even More Space Seat" which offers an extra 4 inches of legroom compared to Core seats. 5 A None No Power Seat 5 A is a standard "Even More Space Seat" which offers an extra 4 inches of legroom compared to Core seats. 5 B None No Power Seat 5 B is a standard "Even More Space Seat" which offers an extra 4 inches of legroom compared to Core seats. 5 C None No Power Seat 5 C is a standard "Even More Space Seat" which offers an extra 4 inches of legroom compared to Core seats. 5 D None No Power Seat 5 D is a standard "Even More Space Seat" which offers an extra 4 inches of legroom compared to Core seats. 5 E None No Power Seat 5 E is a standard "Even More Space Seat" which offers an extra 4 inches of legroom compared to Core seats. 5 F None No Power Seat 5 F is a standard "Even More Space Seat" which offers an extra 4 inches of legroom compared to Core seats. Each seat features a personal 6.8 inch LCD screen with 36 channels of DIRECTV programming. On flights longer than 2 hours there is also a selection of movies. JetBlue now provides FlyFi on their entire fleet. Non-alcoholic beverages are offered complimentary and alcoholic beverages can be purchased for $5. Unlimited snacks such as cookies and chips are also available. All of JetBlue's new A320 aircraft have a redesigned interior, including all-leather Rockwell Collins Meridian seats, 10 percent more overhead bin space and LED cabin lighting. The seats offer improved cushion comfort and knee space as a result of a thinner seat profile and thinner armrests. The new sidewall structure adds space to the cabin and increases shoulder space at the window seats. All middle seats now have an underseat entertainment equipment box, which limits foot and storage space. JetBlue offers passengers the ability to upgrade to “Even More Space” seating. In addition to providing an extra 3-6 inches in seat pitch, JetBlue’s “Even More Space” provides passengers with early boarding privileges, early access to overhead bins, and a fast track through security (only available in select cities). These seats are located in the first 5 rows and in the Exit Rows of the Economy cabin. “Even More Space” pricing varies by route length. These seats can be purchased from JetBlue directly at the time of booking or at check-in. Good legroom in a tired aircraft yet to be upgraded. Still no power, outdated entertainment with tiny, dim screen. Longish flight MEX-JFK. Devices all just about drained since our day began at 4 AM. I am a jetBlue Mosaic member, so we always get the Even More Space seats. But I think Row 11 is the best row on the plane, better than the first 5. So spacious that no one has to get up to let others in the row go by. I should comment that for flights from South America (which we fly every week), none of jetBlue's A320s are upgraded. Legroom is great, but TVs are archaic, no power (which is annoying on an intercontinental flight), the seats are fine, but kind of worn, and there is NO WiFi, despite their claim that all their planes have WiFi -- it does not work on these South American -- US flights. The foot space of this seat is cut in half due to a inflight entertainment box and the curvature of the plane. 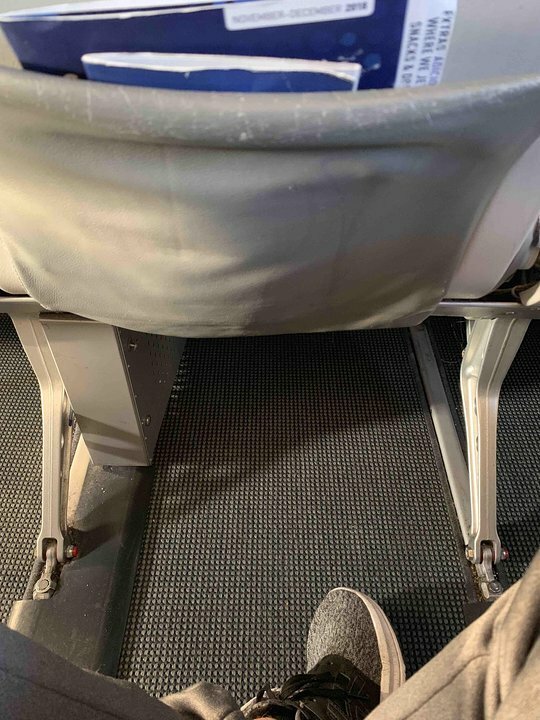 These A320s are bring retrofitted to include two extra rows of seats- enjoy the amazing legroom on the existing A320s while you can Seat 7A is a normal economy seat- nothing unusual about it. I chose to fly to JFK from Portland rather than Seattle because the older A320 seats on this route are much more comfortable than seating on the new A321. This is especially important on overnight flights. As always, these extra room seats are remarkably comfortable. Use the provided sleep mask to avoid the light from the galley. VERY GOOD SEAT; wonderful legroom, recline seat and near the front of the plane. This was a horrible seat to sit in on a redeye transcon (SJC-BOS). Minimal recline (2-3 inches). Worn out cushion made my legs numb. I deeply regretted my last-minute decision to upgrade from a regular coach seat. Legroom was good though. Seat 3A on my flight couldn't recline, which is rough on a transcontinental trip that I paid extra for. Entertainment screen is just slightly larger than my phone, but the quality is terrible (streaky and pixelated). The IFE map is literally just an outline of North America, but doesn't tell you where the plane is. Other than that, at least I can say it got me from point A to point B, albeit late. I was going JFK-STI. Full Flight, August 3rd. Jetblue sales skyrocket. Dominicans are going back to their fatherland. I was one of them. I flew on my first retro plane. It was great! I ate Popcorners & pretzels, the best jetblue has to serve! The flight was damn smooth. The plane wasn't young, from like 2007 or 2008. It wasn't updated. Oh well, still had an amazing flight! Awesome seat. The tv sometimes has problems but nothing serious. There is a great view of the engine but it is hard to see the wing. the noise is not that loud either. Great space, first on first off. extra space seat, provides excellent leg room if you need it. I didn't as regular seats provide ample space for most people and much better than any of the big three domestic airlines, which provide less seat let room. Jet blue is superior to most airlines. We had extra space on the flight prior and this time we had a normal seat. There is a huge difference. Still more legroom than other airlines, but my legs could not stretch out all the way and I felt a little cramped compared to the Extra Space seats. This row is nice, though. Its part of the first to be let on the plane when its time to load up. There was plenty of room to store carryons. Well enough behind the wing to have a view of cities below. The windows are off centered a little, which was nice. There was a wall between windows that I could rest my head on. Small tv, but plenty of tv stations and xm radio stations. 3 movies, too. Snacks and drink are aplenty. Seats 2A and 2B were fantastic seats. The extra space really gave you some room to spread out. Small TVs, but lots of variety of music and tv to watch. Only negative is that the controls for the music / tv are on the armrest. This was a redeye flight and I was trying to sleep. I had my arms on the armrests and kept changing the channel and the volume. It woke me up more than once. Finally unplugged my headphones from the little port. Wished there was power available at the seats. They offer free Snooze Kits for each traveler. They were actually on the seat when we arrived. Ear plugs and an eye mask. Nice! The flight attendants did not bother us, the let us sleep. I didn't notice the lights from their area, or any noise really. It was a great flight. Absolutely amazing. Although the plane was old, the seats were so comfortable and cushion-y. Although the TVs were small, I got to enjoy many live TV channels. The service was amazing! The flight attendants were always on their feet, serving passengers throughout the 2 hour flight. Free Wi-Fi (although it was slow, it still worked), normal drink service, and free snacks, this flight was great! It is an extra space seat but the bulk head limits your ability to stretch like you would if you were in a row with a seat in front of you. You cannot stick your feet underneath. Most importantly it is freezing. The bulkhead is not solild so it doesn't block the air that leaks in from the emergency exit. This is a great place to sit if you are always hot or wearing layers of clothing to go to alaska but not any other time. I was so cold I was uncomfortable. Double window. One for the standard seat position and another for when is reclinated. Regular noise on take offs. Legroom is great. The interior is getting dated. The AVOD is obsolete. Screen kept on shutting off during the flight. Time for a new interior and better entertainment system. The seat-back did NOT recline at all, but was still not uncomfortable on a 4.5 hr flight. While this is very comfortable seats and allows you to be among the first to exit the plane, be sure to bring, or purchase, a sleep mask if you are taking a night flight. 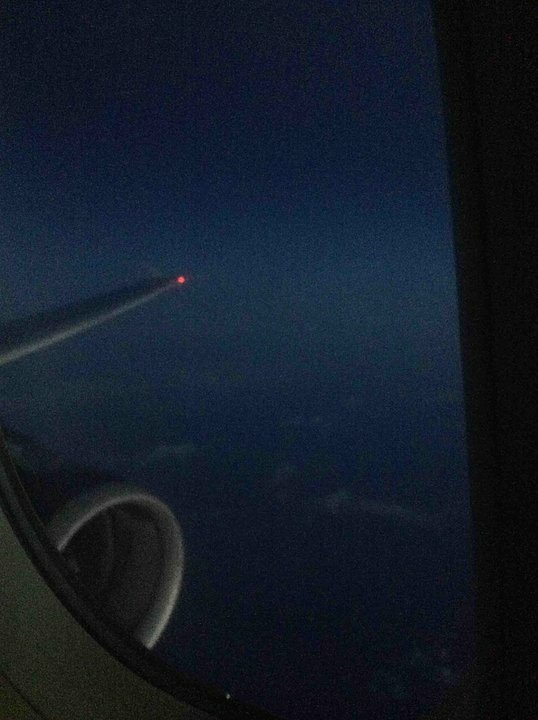 There is a constant bright light in the galley, which is on the right side of the plane, and it shines into the eyes of the passengers in the front rows on the right. Very comfortable. Tray table is small. The TV remote on Seat 1A is in the normal position. There is only ONE window in this row. Seat back pockets are very small. This is the quietest part of the plane as the middle to the back of the plane are very noisy. There is very limited space in the overhead lockers because the flight crew stores water bottles in there. You are the first one to be served during service. You are also the first one off the plane at the end of the flight. I am 6'1" and the Even More Space seats were brilliant. I could stretch completely out and was very comfortable. The aircraft was a bit cold during taxi, takeoff and landing but not long enough for it to be unbearable. Great experience on JetBlue always. I am 5'4 and paid for the Even More Space seat for the first time for my BOS-LAX flight. It was really nice to have the legroom on my red eye flight that I could stretch out almost all the way. However I did not have the charging port that i was supposed to have. You are between 2 windows and you can not comfortably look out the window without leaning forward or leaning back. If you injoy lookibg out if thr widow dont sit here. Enough legroom. Comfortable seats for a three-hour flight. I have flown JetBlue in many occasions and there is no complaint. Great seat, awesome view of the engine! Paid additional for the "Even More Space" feature on JetBlue and was not disappointed. Not only was I able to board first, but I had plenty of legroom and seat 1B was not booked, so I was not afraid to spread out some. While the IFE looked good, I brought my own iPad to watch shows on. First time flying with JetBlue (BOS - LAX) and will do it again! As I am 5'2", legroom has never been an issue for me. However, I carry a large tote soft-sided tote bag (in addition to my purse) that I can just barely squish under the seat in from of me. Because this is a middle seat, I lose some room from a large metal box there. It would be nice to have additional room to store stuff under the seats, thus not taking up overhead space. Otherwise, the seats are fine. Overall, I like to fly on JetBlue over other (especially major) airlines. Overall, the seats are amazing. Even at coach, you can just kick back and relax, because you got more space than you need. Most airlines go for the Average. JetBlue goes beyond. 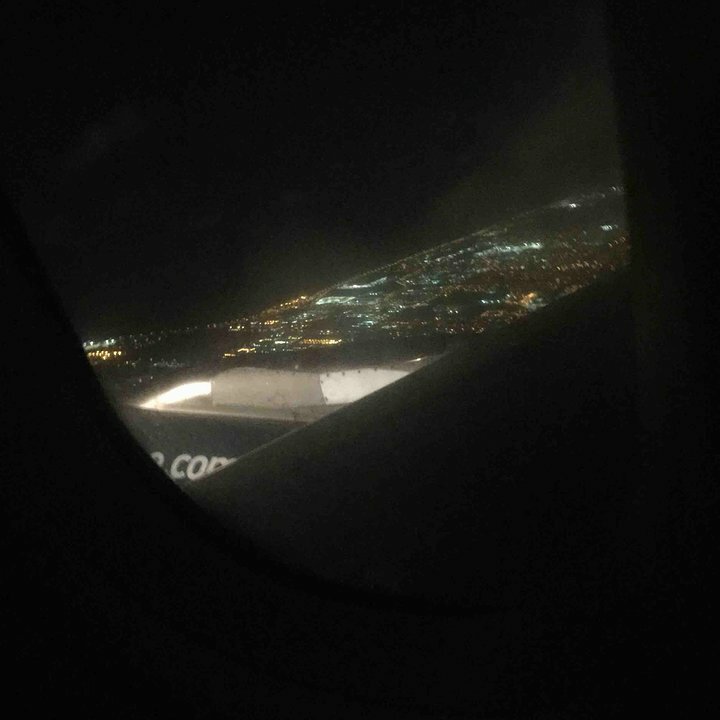 I flew from San Juan to DCA, and sleeping was more than something to manage. It's something that you could even do comfortably in coach. I literally admire these seats, and really like the airline. This was an aisle seat, and it was relatively comfortable. What worked in my favor was sitting next to smaller-framed person. You see, I am 6'3" and I have broad shoulders. I do have larger frame, so I had to ask for a seat belt extender, but the flight attendant was very discreet and professional about it. I fly Jet Blue monthly as they are the airline from PDX to LGB, but the trouble with their Airbus (and the Airbus on Delta) is that very often the electrical does not work, e.g., overhead lights, television, plugs, etc. On the Boeings flown by Alaska everything seem to work. I don't know if the problem is poor maintenance on the part of Jet Blue and Delta, or just tha Airbus is not properly built. The seat was very comfortable. There's nothing bad about the seat that I can say about it, to be honest. - Overhead space directly above seats 1A-C are reserved for FA storage. - Bulkhead is clear so you can stare at FAs when they're in the jump seats. - Light in galley is on for the duration of the flight. Can be bothersome when the rest of the cabin lighting is off. Jetblue is an amazing airline. Friendly pilots and attendants, and cozy wide leather seats. There was alot of legroom, and the "misaligned" window is perfectly aligned in the center with seats 11A and 13A windows halfway in the seat. Basically, there is two windows in seat 12A. The entertainment was great. I loved looking where our plane was. I flew a 2hr 50min flight from Tampa, FL to Boston, MA at 41,000 feet. Perfect flight. I flew this plane from San José to Orlando in April 2015. Those Seats (25A-25F) aren't so bad as Seat Guru says it. By the Way: the Cabin Crew was very, very Friendly and personal. Be aware that you lose approximately 2-3 inches of under-the-seat space due to a large metal box. Appears to be in every middle seat. Wow, I didn't think it was possible to make these middle seats any worse! I had a standard economy seat and thought it was pretty good. Our plane had free wifi so I can watch netflix on my iPad. There is room under the seat in front of you and if you stick your feet under it you can extend your legs fairly far. Overall I enjoyed my flight very much. Far more extra leg room in seat 2D on my return flight than seat 11C, my originating flight. From my perspective, book the first 5 rows for "even more space" and skip rows 10 & 11. Neither flight had wi-fi. Extra legroom seat but the recline is not as deep as some of the forward EML seats. For the 40 bucks i paid the extra the room was well worth it . However on this flight there was no AC to charge my devices which was no fun. I must say i just flew British Air new 787 to London and this seat and room was 10000 times more comfortable and spacious. one more thing. You move through security quicker by paying for this option. I am short (5' 1"). I fly this plane every three weeks, taking a red eye home. For a short person, the lack of full arm rest in the 11 row can be annoying and prevent sleep. For me, I sleep better in a window regular seat! I flew SFO to JFK and this Even More Space (EMS)seat was great in terms of leg room. I'm 6'1" and could extend my legs fully out in front of me without bending them. The price I paid was $80 extra one-way which I think is a little steep. One negative for me, and this is really a crap shoot, is the middle seat next to me was occupied. For most of the other passengers in EMS the middle seat was unoccupied so odds are you will probably get an unoccupied middle seat. The Even More Speed was a non factor on both of my flights. For my days of travel there were no lines at security. It turned out that my flight was diverted to Rochester because of weather and the eight hours on the plane was easier in EMS! Seats 2E and 2F are Even More Space Seats which have more legroom and when you purchase an Even More Space Seat it comes with Even More Speed which gets you throw Security and to the Gate much Quicker and you have access of boarding the plane first. The Front Seats of the plane are the Best Seats because you get on and off the plane much faster. Jet Blue is a great airline and I would recommend this airline and the Airbus A320 to any passenger. Seat 11A was an excellent seat. There was a substantial amount of leg room. One added bonus is that the row in front of it, row 10, cannot recline their seats because it would block the exit door; therefore, you have your complete extra leg room for the entire flight. Although there is no left armrest on this seat, it wasn't bothersome. The only slight downside to this seat is that there isn't much under-seat storage because of the curvature of the plane and the life jacket compartment under there. However, since you can get on the plane early, it's easy to find overhead space for your carry-on. Very loud motor noise throughout the flight in this row. The legroom is really terrible for a premium seat. At 6'4" I was unable to bend my knee past 45 degrees to stretch about my feet. 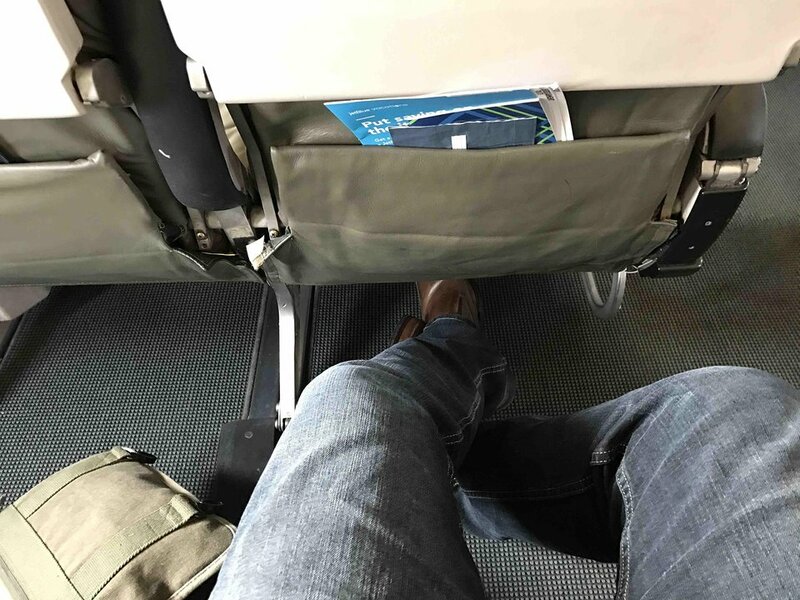 There was even less room to stretch out one's feet than in a standard economy seat. Don't book this row if you want to sleep.